Pat White has been designated a Breeder of Merit by the American Kennel Club in recognition of her many years of quality breeding of AKC Champions. As a committed breeder of quality, structurally sound and healthy Standard Schnauzers, she continues to expand her knowledge of dogs’ health, breeding, and behavior through attendance at numerous seminars and workshops. 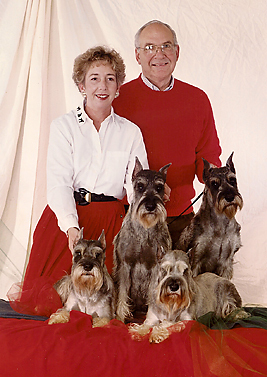 Pat holds and has held various officer/board positions in the Standard Schnauzer Club of America, Potomac Valley Standard Schnauzer Club, the Virginia Federation of Dog Clubs & Breeders, and the Warrenton Kennel Club. Pat and Pete White live in pristine Fauquier County, Virginia, home of large horse farms, wineries, and the rolling foothills of the Blue Ridge Mountains. While Fauquier County is a natural haven, they are adjacent to the metropolitan Washington DC area and 45 minutes from Washington Dulles International Airport. Halcyon Standard Schnauzer puppies are raised in their home with lots of socialization and interaction with visitors and children. Copyright © 2019 —Halcyon Standard Schnauzers • All rights reserved.